Coral as an online casino operator might have only sprung into life back in 2012, but the brand itself has a history that stretches back to 1926. From a bookmaker on the high streets of the UK, this operator eventually became part of the Gala Group in 1991, when it then transitioned into other forms of betting. Buoyed by this partnership, Coral expanded its live betting network to 1,800 venues before relocating its headquarters from the UK to Gibraltar. This move not only enabled the Gala Coral Group to offer more brand products, but it allowed the company to acquire the necessary iGaming licences to offer virtual betting. 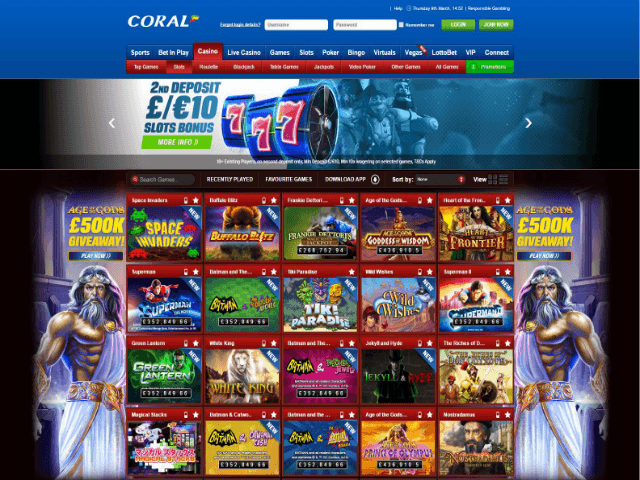 Today, following a merger with Ladbrokes in 2016, Coral Casino is now one of the largest online platforms in the UK. In fact, despite being a relative latecomer to the industry, Coral's calculated moves and mergers have allowed it to become one of the leading operators in 2019. Coming into the industry back in 2012 may have been a disadvantage for Coral if it didn't forge strong relationships with one of the top software providers in the business: Playtech. This partnership has allowed Coral's in-house developers to focus on the site's backend, while Playtech has taken responsibility for filling it with games. Naturally, with Playtech being one of the leading slot game providers in the industry, Coral is now home to some of the most entertaining spinners around. From themed video slots like Rocky and Captain America, to casino classics like Great Blue, Funky Fruits Farm and Mr Cash Back, Coral Casino has everything you need and more. In fact, just as the likes of NetEnt, Microgaming and NextGen Gaming offer progressive jackpot slots, Playtech also offers its fair share of big money games. Regardless of your gaming persuasion, you can play networked and standalone jackpot slot machines with prizes worth upwards of £100,000. Finding the best online slots at Coral is, for want of a better phrase, all about you. What we mean by this is that site navigation can be toggled to suit your personal preference. As a default, the interface is set out in the following way: Tab Bar + game menu. Once you land on the homepage, you're first job is to click the "slots" tab and that will load all the games you can play in the centre of the page. 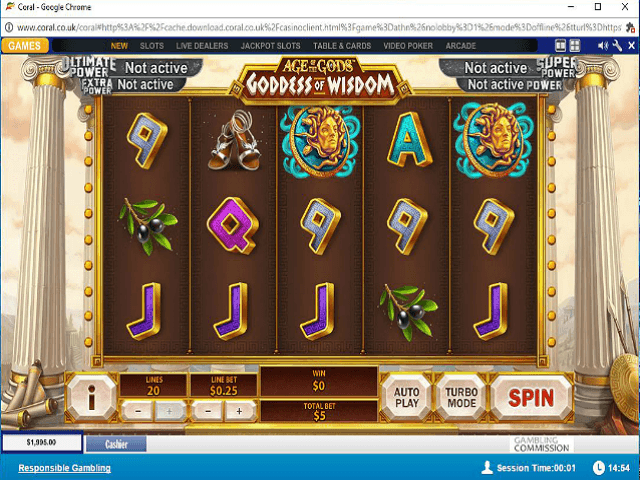 The standard view, when you first visit the site, is a grid containing game boxes that show you the title, logo and whether the slot is available for mobile play. If you find this view a bit much, you can adjust the layout in the top right of the page. Switching from a grid to lines will remove all the extraneous information and simply list each game by its title. Beyond this, Coral's interface also gives you the option to find each game via a search box. However, what's most impressive is the ability to return to your favourite games. When you load up a game, you'll find a star icon that allows you to "favourite" it. When you do this, you'll be able to login to your account and find your list of favourites via the dedicated tab. On top of this, the interface also offers a "recently played" tab which will list all of the games you played the last time you were online. Finally, to improve usability even further, each lobby can be sorted by a range of filters, including: most popular, new, jackpot size and A-Z. As if all that wasn't enough, Coral Casino is also available as a downloadable app. 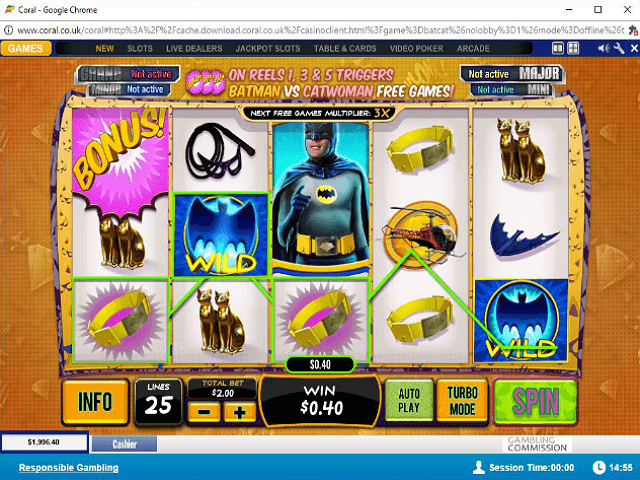 Offering all the same features and filters but via your desktop, this platform is perfect for those who want even quicker access to the best slot games. As we've said, the might of Playtech and the industry experience of Coral have helped create one of the most impressive slots lobbies out there. Literally crammed with slot games of all shapes and sizes, players from both ends of the playing spectrum should have no trouble finding a spinner that suits their needs. Video Slots – By far the most engaging game variant available on the site, video slots provide the perfect combination of animations, images and prizes. For example, Space Invaders and Sherlock Mystery not only give you five reels and multiple win lines, but games that are crammed with features. Jackpot Slots – If you're in the market for big money payouts, the jackpot slots are the kings of the castle. Thanks to Playtech's licensing deals with companies like Marvel, you can play movie-themed games that are both attractive and capable of dispensing £100,000+ prizes. Mobile Slots – When you want to game on the go, Coral offers both an iOS and Android app. In fact, what's great about the site's desktop software is that it shows you exactly which slots are available for mobile use. In the top right corner of each game box, you'll see a mobile icon if the game appears in the app. Does Coral Casino Offer Progressive Jackpot Slots? Coral is fully loaded with progressive jackpot slots thanks to its relationship with Playtech. Housed in a tab that's naturally titled "Jackpots", these progressive slots are the best way to win a lot from a little. One of the highlights of Coral's selection of big money spinners is that it contains standalone games and networked games. Each medium has its own advantages, but whichever option you choose, the progressive jackpots will easily top £100,000. In fact, when you play jackpot slots like Monty Python's Spamalot or Jackpot Giant, the money on offer will be in excess of £1 million. Can Players Demo Coral Slot Games for Free? Barring jackpot slots, every set of reels inside Coral Casino can be spun for free. Demo slots are accessible via the main lobby and all you have to do to get into the action is hover over the game box and choose "free play". Given the dynamics of the site, you don't actually have to be a member of Coral to play free slots. However, if you want to switch from demo slot games to real money games, you'll need an account. In fact, if you really want to make the most of what Coral has to offer, you should create an account before you start playing free slot games. Once you do this, you'll be able to switch from game-to-game with a click of a button. Depositing and withdrawing at Coral is highly secure thanks to full SSL encryption, recognised UK payment methods and the UK Gambling Commission's oversight. Backed by these factors, Coral is able to offer minimum casino deposit options from £5. Not only that, but each of the payment methods can be used for fee-free casino withdrawals that will be processed, on average, between 2 to 5 working days. How do you get more for less at Coral Casino? Simple: take advantage of the latest offers and promotions handed out by Coral Casino's bonus elves. At the top of the shop, new players can get a welcome bonus worth £50 and, what's better, you only have to deposit £10 to get it. This casino bonus is one of the most accessible in the industry and all you have to do to unlock this free cash is to wager 24X the bonus amount. Tying Coral Casino together in a safe and secure bow is a host of player protection policies, technologies and certificates. For starters, Coral is licensed by the UK Gambling Commission which also means its games are tested for fairness by eCOGRA. To complement this regulation, the site offers a minimum of 128-bit encryption on all transactions and you'll have access to an expert customer support team all hours of the day and night via the following methods: Telephone: [0800 44 0011] and Email [[email protected]].